The newest tool against unregulated and illegal fishing is incredible. 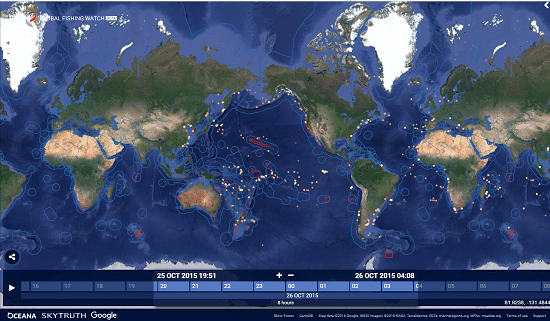 Oceana, Skytruth and Google Earth Outreach worked together to create the Global Fishing Watch. The beta version of the site is now open to the public, and you can quickly and easily create an account and start using the program within seconds. What exactly is Global Fishing Watch? Think crowdsourced protection of the oceans. Global Fishing Watch is a massive step towards fighting illegal fishing. The program is still in its beta version. But as it grows, it learns. The Global Fishing Watch AI system is learning everyday what behaviors are linked with unregulated, illegal, and suspicious fishing practices. This is because of their state of the art AI system which is becoming scarily accurate in determining what vessels are doing in the open oceans. The program uses “Machine Learning” at a global scale. It learns from its mistakes and the algorithm becomes more and more accurate as the program goes on. Everytime that a user submits data, the program grows smarter. Remember, this program is just getting started. While there are already benefits being found, the program is only going to get more accurate and useful. Illegal fishing will become more and more difficult over time. If you have an internet connection, you can be a part of this program. This is the most effective tool available right now to track commercial vessels. Anyone with a computer and an internet connection can watch over protected areas and illegal fishing zones and track vessel activities. That’s not all. The program is completely free to use. Everyone can be a part of fighting against illegal fishing. One of the main priorities of the Global Fishing Watch program is to help raise awareness of the level of fishing happening in our oceans. 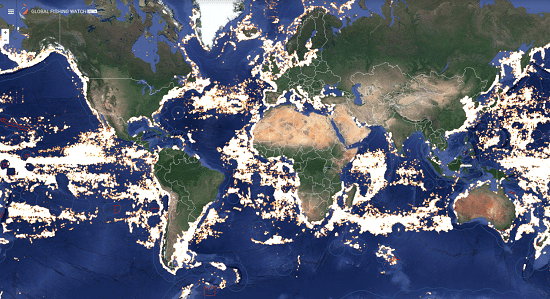 We can imagine that there are many fishing vessels, but before you actually see a heat map of what is happening, you cannot quite comprehend the scope of the issue. When you take a look at a map for an 8 hour time period, you see vast swathes of blue. It is easy to think that overfishing is not a problem at all. When you look at the full two years of data, a different picture is painted. Check out the comparison below. What do you do if you are a smaller, developing nation and fishing vessels from a more powerful country are illegally fishing in your oceans? Proving that unregulated fishing is happening is the first step, and often incredibly difficult. Global Fishing Watch is partnering with local governments to give them the tools they need to start protecting their waters. There are thousands of small vessels that dart in and out of waters, and before Global Fishing Watch it was impossible to track them all. Now, through the power of crowdsourcing and the combined efforts of scientists, conservation groups and people like you and me, the balance of power is shifting. Have you heard of the island nation of Kiribati? The nation suspected a company of violating their off-limits zone. While they had suspicions, they lacked concrete proof. That is until the Global Fishing Watch stepped in. The imagery that the program provided was rock solid proof that the vessel had been illegally fishing. The outcome? A $2 million dollar penalty that never would have happened without this incredible tool. Illegal fishing will become more difficult the more tools that smaller nations have to protect their waters. Will the Global Fishing Watch end illegal fishing? 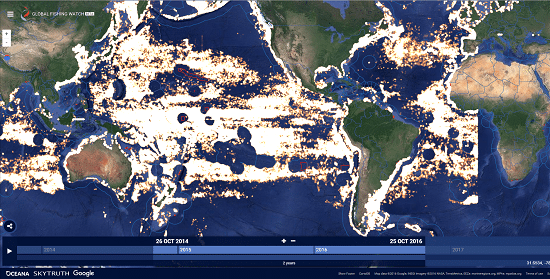 The Global Fishing Watch uses AIS data to track ship movement. AIS stands for automatic identification system. Smaller vessels are not required to use it. Pirate fishing vessels simply will not use it at all. What the Global Fishing Watch program is best for is stopping large scale commercial fishing in unethical and illegal ways. For example, if a massive fishing vessel is transmitting and then suddenly turns off transmission as they enter a protected zone? Suspicious! If a vessel turns off their transmission as they go through a risky area with a history of piracy? Not nearly as suspicious, as they are most likely not wanting to broadcast their location to nefarious parties. If there are trends in certain companies purchasing seafood from suspicious vessels, consumers may realize they are potentially buying illegal seafood. No company wants that reputation. One of the keys to the long term of success of the Global Fishing Watch will be consumer pressure against shady tactics. It is not just Google, Oceana and Skytruth that are making this program happen. These three are the biggest players in the project, however. If you have not heard of Ocean and Skytruth, they are two major organizations promoting sustainability in the seafood industry. Oceana is a massive international advocacy organization that is working towards one goal. Conserving the ocean. SkyTruth is a nonprofit who’s technology in remote sensing and digital mapping allowed the Global Fishing Watch program to flourish. Everyone has heard of Google. What people may not have heard of is Google Earth Outreach. It is one of Google’s many arms, and has found successes helping clear landmines in countries that have histories of war as well as giving the tools to small tribes to protect their traditional lands. The Global Fishing Watch could not have come this far without the Leonardo DiCaprio Foundation, Marisla Foundation, Bloomberg Philanthropies, The Wyss Foundation, The Waterloo Foundation and Adessium Foundation. All of these foundations and charities are working towards a future where IUU fishing is cracked down on, hard.